← 100 Million Chinese Food Cartons per Year! 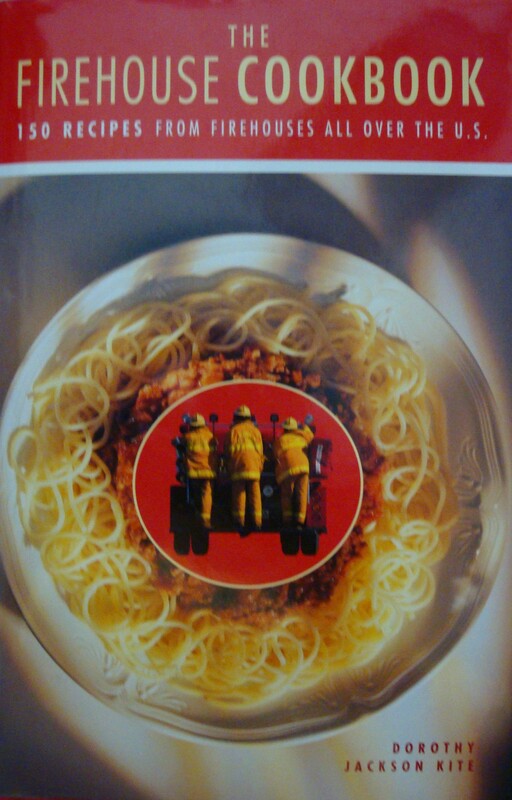 Every so often I come across a cookbook featuring recipes from firefighters around the nation. It seems like firehouse cooking (and firehouse chefs) are imbued with an aura of mystery around their food. After all, it is a select enclave of men and women, who enjoy the fruits of the chef. It seems natural that these dedicated individuals, who go to bat for the rest of us and keep us safe should have camaraderie among them, and why shouldn’t this extend to that most basic of human needs, eating and sharing food? Meandering around the internet lately, I have looked at one of the most FAQ asked about firefighters: does the city/county pay for the food they cook at their stations, while on their shifts? In just a random sample of information from about two dozen firefighting stations across the US, the answer was a resounding “no”. It appears that the common theme is that each of the firefighters assigned to a station contributes a fixed amount out of his or her own funds for food, determined by mutual agreement. 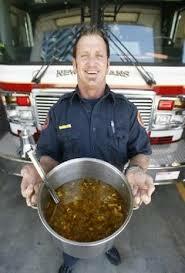 Most firefighter kitchens have several rotating chefs and many have their own specialties. Some stations have essential appliances paid for them, for example a refrigerator and a stove, but the firefighters must pay to equip it with pots, pans, and the like, not to mention the food. A search of news items across the country has also raised another FAQ: why do I see the firefighters parking their fire engine in the grocery store parking lot and going in to shop? Well, think about it. 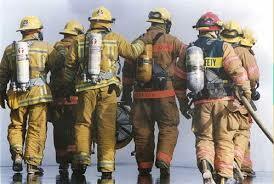 These men and women are on duty, ready at a moment’s notice to assist you. Would you rather they drive in a private vehicle, start shopping, get a 911 fire call and drive back to the station to get the fire truck? Not! “Be prepared” is a good motto. As a matter of fact, in my grade school, Kipling Grove Elementary School, our motto was from Elmer, the Safety Elephant, whose placque in the main hall admonished us daily to “be prepared”. 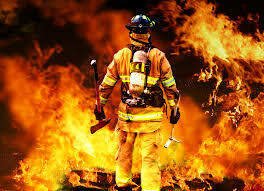 According to the Internet, there were 48,800 registered fire departments in the US as of 2012. These fire departments employed 1,129,250 firefighters, which include career professionals, volunteers and those paid per call. 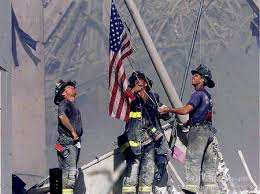 Also in 2012, according to NFPA (National Fire Protection Association) there were 1,375,000 fire calls placed to these departments, however, these departments also responded to numerous other calls: 21,705,500 calls for medical aid, 2,238,000 false alarms, 360,000 hazardous materials, 1,326,500 “mutual aid” and 694,000 “other hazardous conditions”. “Other” calls accounted for another 4,155,000 calls for a grand total of 31,854,000 calls made to US fire departments in 2012! It’s a wonder they ever get time to eat, let alone cook! 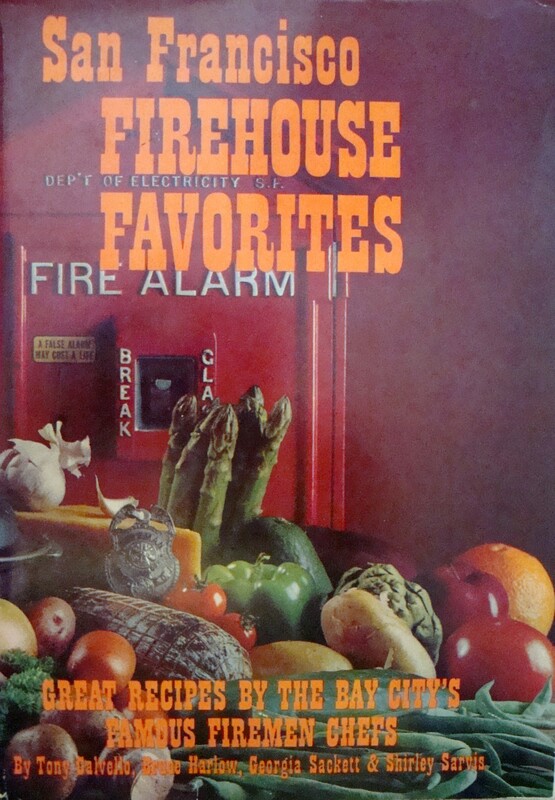 In my collection, I have several cookbooks featuring firefighters: “San Francisco Firehouse Favorites” by Calvello, Harlow, Sackett and Sarvis; “Firehouse Food” by Dolese and Siegelman; “The Firehouse Cookbook” by Kite, and “Fire House Cook Book” by Kipp Rix. 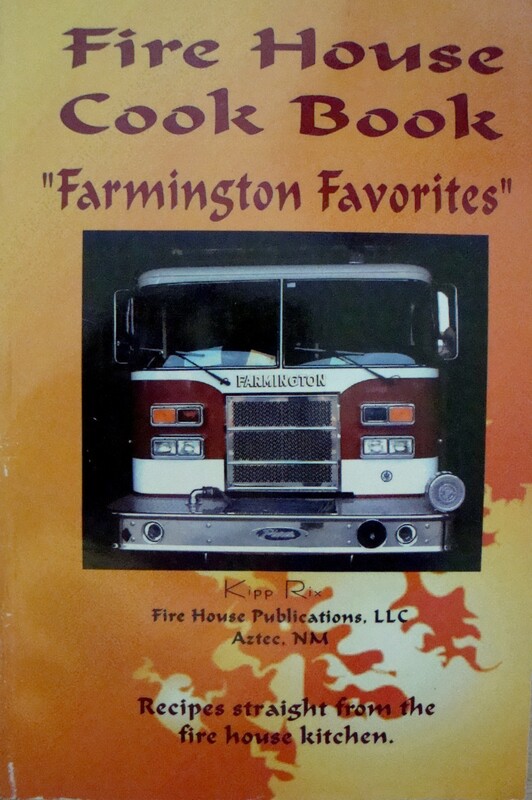 Dorothy Kite, in her book “The Firehouse Cookbook” says, “One of the first things a rookie learns is that in order to eat at the firehouse, he must learn to cook”. And, George Dolese and Steve Siegelman in “Firehouse Food” note that, when firefighters eat together, they’re “…creating a moment of happiness in a tough, stressful world. No wonder their food is so satisfying”. “Smoke and Fire Black Beans”, “Blackened Red Snapper”, “Smoked Turkey Club”, “Night Watch Snack” and “Kamikaze Gumbo” are just a few of the recipes from these cookbooks. 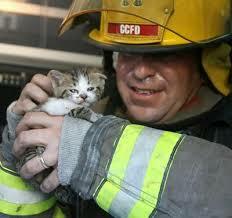 No one ever said that firefighters don’t have a sense of humour! 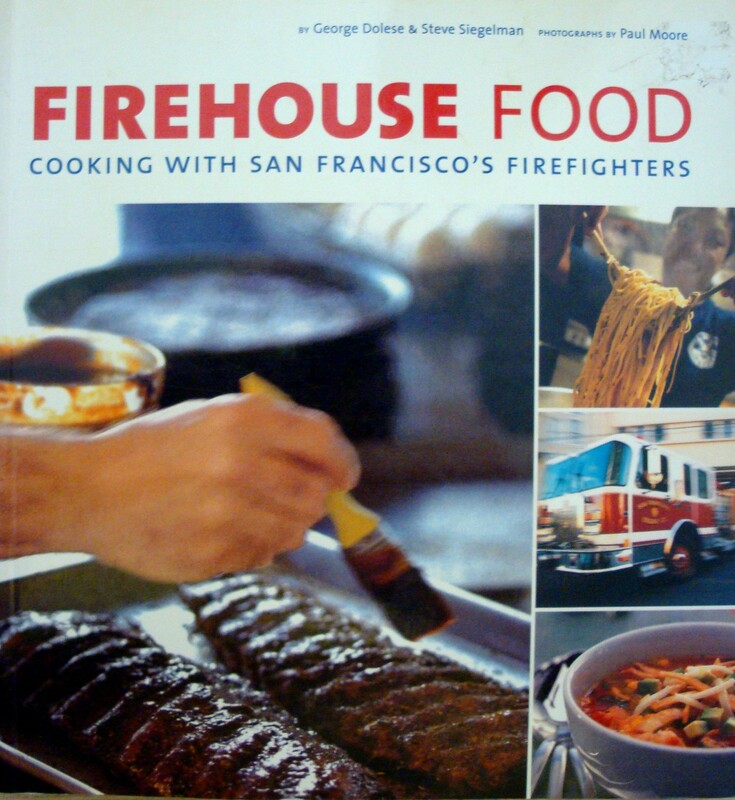 In “San Francisco Firehouse Favorites”, the authors relate some of the culinary comments from firehouse chefs: “Never cook a turkey more than two hours; just adjust the heat”, or “Never blow your own smoke” (don’t brag!). They also note that one of the San Francisco firefighters insisted that his cigar ashes improved the flavour of his Burgundy pot roast. Below is the recipe for “Smoke and Fire Black Beans”, courtesy of Steve Feiner, Truck No. 16, San Francisco Fire Department, from “Firehouse Food” by George Dolese and Steve Siegelman. The “smoky” flavour comes from both the ham hocks and the chipotle chile. Pour the beans onto a rimmed baking sheet and pick through them, discarding any small stones or foreign matter. Rinse them in a colander under cold water and place the beans into a large pot with the water, ham hocks, onion, garlic, bay leaf, oregano and chipotle. Bring to a boil and reduce the heat to a very low simmer. Partially cover the pot and cook until the beans are tender, about 2 hours. Remove the ham hocks, and once cool enough to handle, pull the meat away from the bones, discarding bones, skin and fat. Shred the meat and add to the beans. Season to taste with salt and continue to cook for 15 to 30 minutes until the beans are very soft and creamy. Discard the bay leaf and ladle the beans into individual bowls, or serve family style. The next time you see a fire engine parked at your local grocery store, remember: they’re not shopping for dinner on your dime, or on your time! This entry was posted in Cookbooks, Cooking, Eating, Menu Planning, Recipes, Uncategorized, Vintage Cookbooks and tagged cookbooks, Cooking, Fighting 17th, Fire Departments, Fire Fighters, Fire Station, Firehouse Chefs, Firehouse Cooking, San Francisco Firefighters, Sue Jimenez. Bookmark the permalink.